Is it possible the Earth’s crust can move as Charles Hapgood described in his 1970 book “The Path of the Pole? If it had happened, wouldn’t we have ancient records? And if it had happened, wouldn’t our scientists have already proven that it can! We must remember that as recently as the 1960’s we were building space rockets to the Moon before we knew whether it’s craters were dried lake beds, the result of volcanic eruptions, ice, or meteor impact sites. What if … ancient records exist but we just can’t read them? What if… the truth behind the great legends is simply that all life on Earth hung in the balance in very recent human history? Did these memories foster the myths of the gods? The Greek god Hermes represents swiftness and today this ancient symbol (shown above) represents medicine. But what did it originally mean? Look at it closely. Exactly what does it depict? Prior posts have shown there are key elements in ancient art which demonstrates there was a continuous desire to perpetuate a core set of ideas. Today these ideas are identified as religions composed of myths. We seldom, if ever, attribute the purpose of religion to… the preservation of Earth’s history and its measurements. If religion’s original true nature was basic Earth science, then ignorance, both then and now, has fostered the myths of gods. Does the symbol of Hermes above tell us a double comet impacted Earth at the former pole? Does the Venus of Schelklingen tell us a double comet decapitated mother Earth? If only they had spelled it out clearly!!! Or did they?……. Image of bands on ocean floor at mid-Atlantic Ridge. Measurements of intensity and direction of magnetism taken in the above mentioned studies and others have been used as evidence that the Earth’s magnetic poles flip. 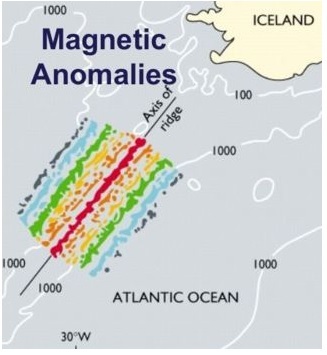 The cooling lava exuded along the Mid-Atlantic Ridge records the direction of the Earth’s existing magnetic field at the time. Because it is striated in opposing N-S, S-N bands the assumption that it flips has been made. It is true and proven that the lava acts as a recording medium. The argument here lies with assuming it is found in striated bands solely because the poles flip. These long striated cooled lava flows are ‘weak’ magnets under enormous ocean pressures which suffer breakage from earthquakes and other shifting. This leads one directly to the key question: what happens to a magnet when it breaks? In Image A (below) at the end of the chain is a broken magnet and it behaves the way one expects. A new north and south pole has formed and it obediently lines up. But this is not always the case. Magnets of different shapes will sometimes reverse their physical position entirely to regain an opposite pole attraction as shown in the image of the circular magnet. Image A is a photo of 4″ long stainless steel magnets of a ‘medium’ strength. The north pole is marked with red tape on each magnet. They ideally line up in a N-S, N-S chain as one expects and so can model these long lava striations well. Over time earthquakes and other local disturbances fracture the hardened lava flows. The well known ‘opposite poles attract model’ (N-S -N-S) is obeyed. However, it would be an oversimplification to assume the solidified lava does not also fracture in long sections paralleling the rifts. What then happens to these weak fields? Observe the layout in Image B as rows of the long magnets are set beside each other. 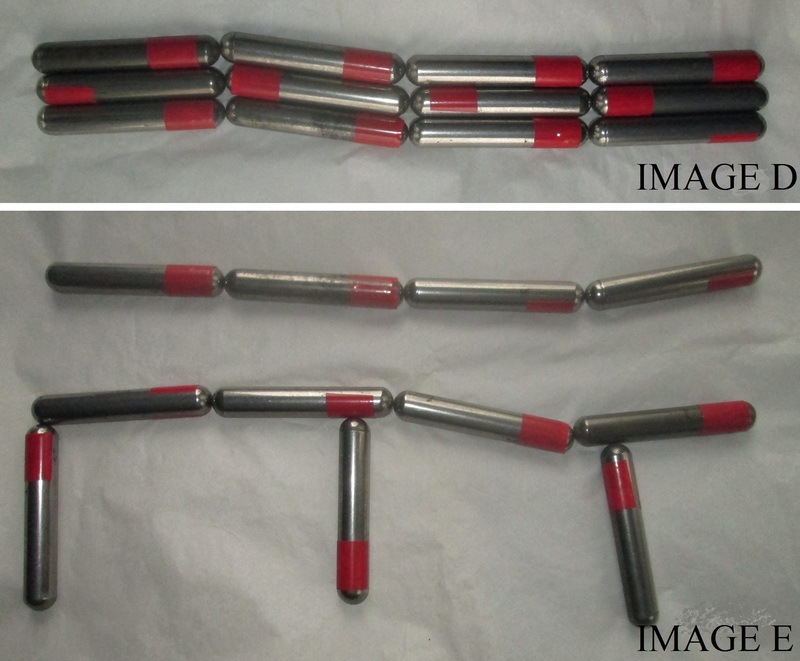 They form separate magnet chains with parallel N-S poles in line. They suddenly no longer want to pull together but push away in long lines. There is no way to bring them together except by constant and continuous force which presumably the ocean floor can provide in many locations. In other locations, the striated lines would push away from each other in the same manner as the steel magnets. However, if one jiggles the magnets they will line up at the midpoint of the opposite magnet (Image C) but that requires a shift of the entire long chain or shifting after fracturing in smaller sections. If the chains fail to come back together they will still attract sediments to fill in ‘magnetically’ where the charged lava ‘most desires’ it. 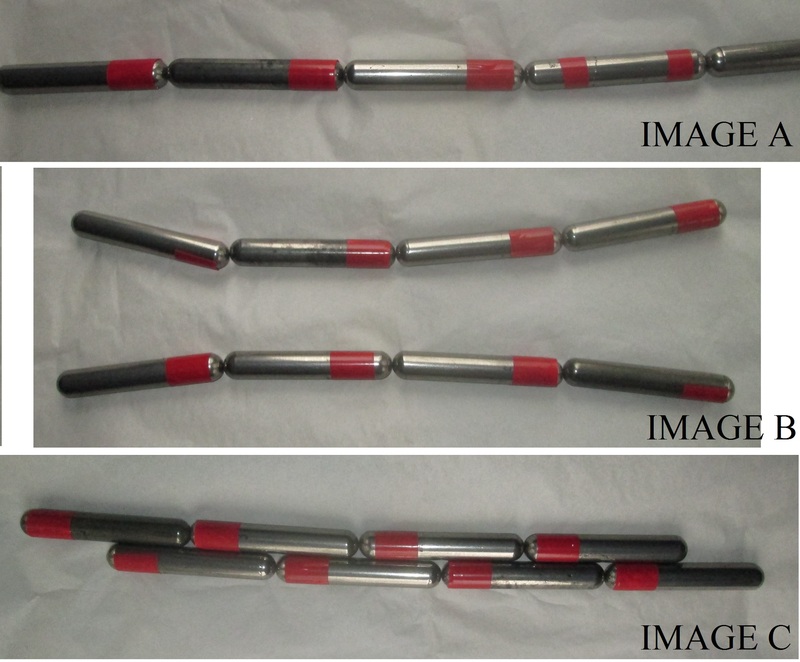 Then we may speculate that separated N-S, N-S chains will create either the pattern seen in Image C or a N-S, S-N pattern as we see in Image D.
But what about a weak magnet that fractures in parallel and the strips are forced together? It is an easy matter to stroke a needle over a magnet and induce magnetism in the needle. It is also an easy matter to create two or three of such magnets in the same needle. One can even create a needle with identical poles at opposite ends and the opposing poles in the middle with a space between them. Inducing magnetism in metals is an easy process so it is not far fetched to suppose that a multi-fractured layer can exhibit flipping (de-magnetization followed by re-magnetization) in parallel strips in the direction of charge. Indeed, fracturing is probably not even necessary if the material itself varies enough in nature to allow bands of magnetized metals to alternate with non-magnetic materials. And then one also has to consider the possibility that the new lava being exuded has a pole orientation at an angle to that which has cooled. What then happens? In Image E the magnets are set at 90 degrees to the chains. In setting the perpendicular magnets they automatically are drawn to the opposing poles as seen. Jiggle them slightly and they will shift as seen in Image C or D.
Therefore, the conclusion that the poles flip because the lava flows are striated N-S, S-N cannot be made. The exercise does suggests that lava flows will lay down in an orderly fashion. It will either develop into bands that are all N-S or in bands that alternate N-S then S-N. The direction of the magnetism in the exuding fluid lava can be under the influence of the Earth’s poles or under local influence. Regardless, it will prefer to form over time one of the two patterns seen above in Image C or D.
Yet we know the magnetic north pole has traveled recently from south of Victoria Island towards true north, that the south pole has also traveled, that magnetic field strengths are varying and that magnetic fields recorded in sedimentary rock appear to record shifting poles. So, there is certainly much more to discuss and learn. More to come…. in the next section. Back to previous section. Back to beginning.